I see suddenly that my downstream bandwidth is 400 KBps which is the maximum my ISP gives me, so there's an application downloading at its top capacity. The thing is I didn't start any download, so it's doing it in the background without telling. How can I know which app or process is using it? Or, basically, how can I determine how much bandwidth each open process or application is using? This help at all? Take a look at the NetMonitor Sidekick add on. Have not tried it myself but will probably load on virtual machine to see how it works. Quote: "How can I know which app or process is using it?" You can try nettop(1) in the Terminal. It is pre-installed, and refreshes every few seconds to provide a dashboard of all open network connections (by process) with their usage. Better than lsof since it shows the usage data too. Then hit 'd' and look for odd-looking entries or entries with consistently large traffic in the 'bytes in' or 'bytes out' column. The 'd' instructs nettop to only show differences in each screen refresh. If you don't recognize the process name, Google it. If you don't want the process around, get the pid (the number next to the process name in nettop), and kill it with kill -9 <pid>. If that doesn't solve it, find out if you can uninstall the process. If you're interested in the destination the process is talking to, but the destination IP address doesn't have a reverse DNS hostname (like in the previous example), then try visiting that IP address in a web browser as https://IP, click the broken lock icon in the address bar, and view the certificate details to find out which domain is served there (*.google.com in this case). This won't work if SSL port 443 isn't open on the destination. 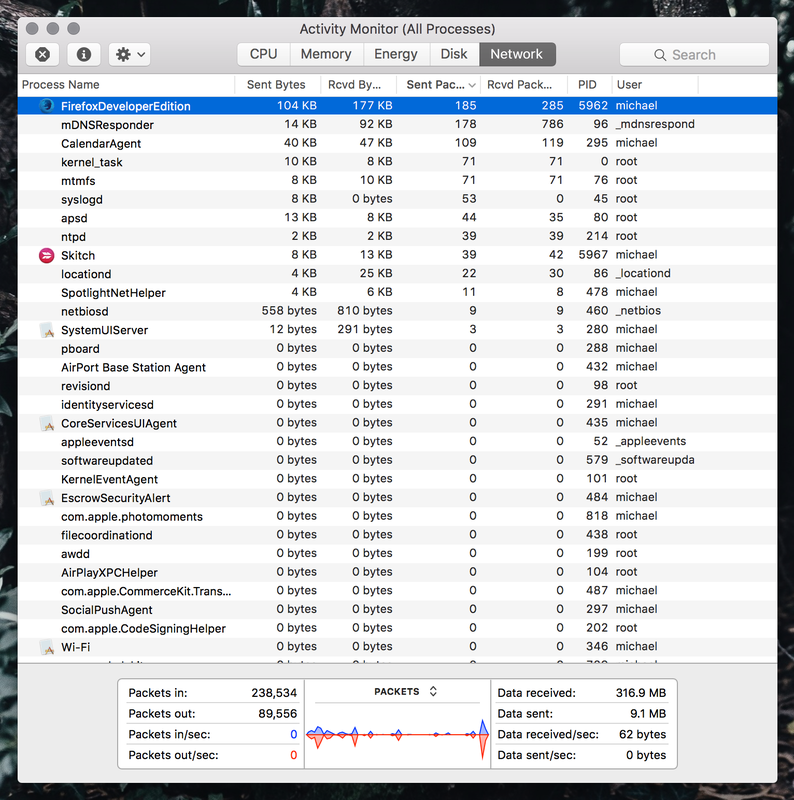 You can easily view all network activity from the Activity Monitor; it's built right in to OS X.
Rubbernet is a really great app that allows you to see the per application network usage of your Mac plus it supports Remote Monitoring. You can install a Rubbernet plugin any Mac that you have administrative access and then monitor the per application bandwidth utilization of all the Macintosh on your network from your own computer. It does cost money (30 Euros on their website but for some reason its $19.99 on the Mac App Store but they have a fully functional Free Trial on their website. I haven't bought the app yet, so I can not confirm that you can buy one license for the app and then install the plugin on any number of Macs for now additional charge. But that seems to be the situation. The Developers are the same folks who do the Linkinus IRC Client. lsof and iftop (direct Link to install package) are the best tools that come to mind. Also, take a look at this question. Another option that is not quite as good as it does not have any kind of remote monitoring mechnaism and didn't seem to do as good a job is OS Track. Its also available on the Mac App Store for free. I didn't really like this app as it seemed to consume a lot of resources itself. But that might be something they fixed in a later version. Not the answer you're looking for? Browse other questions tagged macos data-transfer . How can I see which apps are using my Mac's internet bandwidth? How can I throttle bandwidth for iTunes ony? App to see how my application are using my upload internet bandwith? How can I see which app/process is using up my VRAM? What process is using UDP port?